Although the conference I am attending has been going for a day, its official opening was not held until this evening. 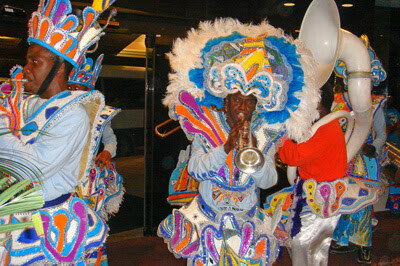 It was held at the Wyndham Hotel on Cable Beach, and after the opening a Junkanoo group came through the hotel making the loudest noise I have ever heard a dozen or so people make. As well as the drums and brass instruments that they were playing, the band members were blowing whistles and horns, and ringing cow bells. It was an impressive kaleidoscope of colour and sound. 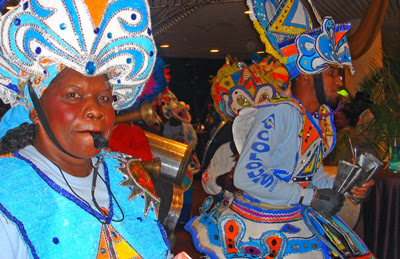 Junkanoo is a festival that is celebrated in the Bahamas on Boxing Day and News Year’s Day each year. 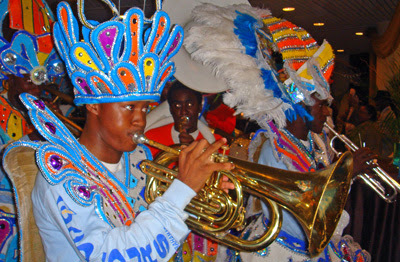 It has its origins back in the days when slaves from West Africa were given a day off each year after Christmas, and they danced and made music with improvised instruments to celebrate their temporary freedom.